Excerpted from a paper presented at the Conference and Exhibits on Small Computers. Session on Applications in Engineering and Science Clemson University. Clemson, South Carolina. May 23-24, 1979. * The information contained in this article was developed during the course of work under Contract No. AT(07-2)-1 with the U.S. Department of Energy. Small, desk-top Commodore PET® computers are being used to solve nuclear instrumentation problems at the Savannah River Laboratory (SRL). The ease of operating, programming, interfacing, and maintaining the PET computer makes it a cost-effective solution to many real-time instrumentation problems that involve both data acquisition and data processing. The IEEE-488 GPIB (General Purpose Instrument Bus) is an integral part of the PET hardware. This paper reviews GPIB design concepts and discusses SRL applications that use the PET computer as a GPIB controller. Since the development and the commercial introduction of the IntelM* 8008 8-bit microprocessor in 1972, SRL has used programmed microprocessor-based digital systems to solve laboratory instrumentation problems. The initial cost of $200 per unit for the Intel 8008 module made it an attractive design component for sophisticated digital systems. Several systems1 3 were designed with this module. Those systems are still used daily and have operated reliably and required very little maintenance. In 1977 self-contained, desk-top microcomputers appeared in the electronics industry market. Commodore Business Machines, Inc., began delivering its PET-2001 computer, which was the first "affordable" integral single package unit for the home computer novice. The single package unit costs $795. The specifications, such as an advanced BASIC* interpreter, were also attractive. Integral input/output hardware and software to support the IEEE-488 GPIB make the PET computer a versatile controller and data processor for laboratory experiments. * Intel Corp., 3065 Bowers Ave., Santa Clara, CA 95051. ** Motorola, Inc., Box 20912, Phoenix, AZ 85036. ** MOS Technology, Inc. is owned by Commodore Business Machines, Inc., Palo Alto, CA. The PET has three ports to connect I/O peripheral devices (Figure 1). 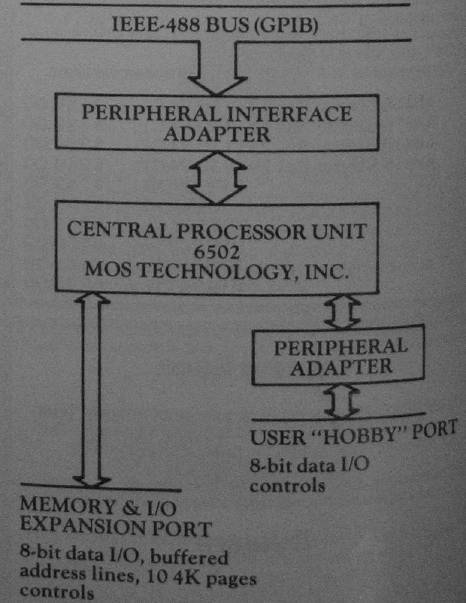 A portion of a peripheral interface LSI module (MOS Technology 6522) is dedicated to a user "hobby" port that allows an 8-bit exchange of data with I/O devices. Also, that port can supply a programmed frequency square wave signal to external peripherals. An expansion port for memory and I/O devices has buffered central processing unit (CPU) signals (data and handshake controls) and decoded 4K page addressing signals. Both the expansion and "hobby" port can be controlled by "peeking" and "poking" from a BASIC program or by a custom machine language program8 that resides in memory. A short machine program might be loaded from cassette via a BASIC program (for example, as a DATA STATEMENT) or more complex machine programs may be installed as permanent additions to firmware. The IEEE-488 GPIB port is supported by the BASIC and operating system firmware as the primary peripheral I/O port. It is controlled from BASIC with file structured "print," "get," and "input" commands. Commodore peripherals (printer, disk, etc.) are "intelligent" GPIB devices. In December 1974 the IEEE Standards Board approved what is now known as IEEE Standard 4889 10that describes a general purpose instrument bus (GPIB) for programmable instruments. The GPIB is an improved version of HP-IB (Hewlett-Packard Instrument Bus) used with a family of instruments from Hewlett-Packard Co. GPIB uses a party-line bus structure to which a maximum of 15 devices may be connected. 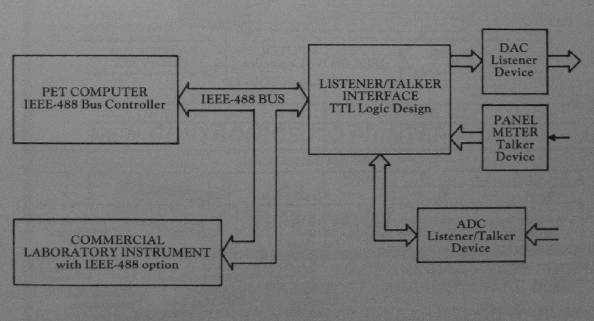 Sixteen signal lines (Figure 2) provide communication of 8-bit commands and data bytes between a bus controller (such as PET) and "listener" and/or "talker" devices connected to the bus via a standard cable. The versatility of the PET computer/GPIB controller makes it a cost-effective solution to many SRL instrumentation problems (Figure 3). Although our problems encompass a variety of widely different requirements and constraints, one (and sometimes all three) of the PET interface ports can be used to connect the PET to real-time I/O peripheral devices. A simple application uses a PET and the IEE-488 bus to control two commercial devices, an Aston* event scaler and a printer. Events from a gamma ray detection system are automatically counted; sample concentration of Krypton-85 is computed; a formal test report is printed. All programming is in BASIC. Data are also archived on cassette tape so that a more complex data processing program on selected data could be run on the PET later. * The Aston Company, Atlanta, GA.
A system has been designed and partially implemented to control and collect data, compute results, and print reports on information from a Princeton Applied Research* (PAR) electrochemical instrument. The complete system will use GPIB and the memory I/O expansion ports of the PET. Currently, PET monitors and controls a PAR 179/173D instrument and a digital panel meter and an ICS 4883 parallel data coupler. A 9K byte BASIC program operates the system. At a future date, high speed data from a PAR 174 instrument will be monitored by PET over a "direct memory access" channel into the I/O expansion port. Future applications currently in development phase will use PET with a microprocessor-based analog data acquisition subsystem on the GPIB. * Princeton Applied Research Corp., Box 2565, Princeton, NJ 08540. PET computers are inexpensive, effective GPIB bus controllers. Using GPIB instruments, in-house engineering development is minimized, and therefore, reduces systems cost and implementation time. BASIC programming is easy and final system program is usually written by the experimenter; engineering support will provide I/O subprograms either in BASIC or machine language. 1. J.S. Byrd. A Desk-Top Microcomputer. Thesis, University of South Carolina, Columbia, SC (1973). 2. J.S. Byrd. "When Your System's Data Rates Differ, It's Time for a Microprocessor." EDN, pp 57-62 (November 20, 1974). 3. J.S. Byrd. "Microcomputer-Based Control and Data Collection for a Mass Spectrometer." Applied Spectroscopy, Vol. 30, No. 1, pp 27-31 (Jan/Feb, 1976). 4. J.S. Byrd, R.J. Sand. Microcomputer-Based Pneumatic Controller for Neutron Activation Analysis. USERDA Report DP-1439, E.I. duPont de Nemours and Company, Savannah River Laboratory, Aiken, SC (1976). 5. R.J. Sand. SRL/6800 Microprocessor Hardware Manual, USDOE Report DPSTM-DC-1, E.I. duPont de Nemours and Company, Savannah River Laboratory, Aiken, SC (1979). 6. Hardware Manual, MCS6500 Microcomputer Family, Second Edition. MOS Technology, Inc., Norristown, PA (1976). 7. PET 2001-8 Personal Computer User Manual, First Edition. Commodore Business Machines, Inc., Palo Alto, CA (1978). 8. Programming Manual, MCS6500 Microcomputer Family, Second Edition. MOS Technology, Inc., Norristown, PA (1975). 10. Jim McDermott. 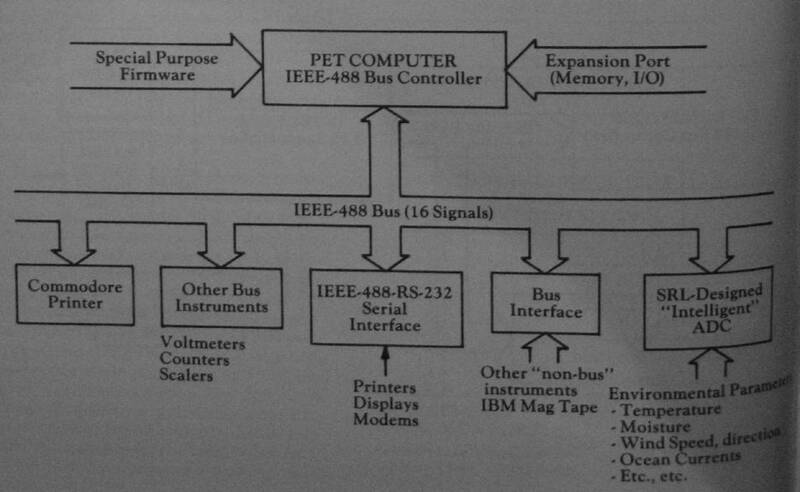 "The IEEE 488 Bus Plays a Major Role in Programming Instrument Systems." Electronic Design 24, pp 76-80 (November 22, 1976). 11. D.C. Loughry, M.S. Allen. "IEEE Standard 488 and Microprocessor Synergism." Proceedings of the IEEE. Vol. 66, No. 2, pp 162-171 (February, 1978). 12. Daniel Levasseur. "Simplify IEEE-488 Implementation with a Multifuneration Interface." EDN, pp 105-113 (March 5, 1979). 13. John Pieper, R.J. Grossi. "LSI Streamlines Instrument Interface with Standard IEEE-488 Bus." Electronics, pp 145-150 (April 26, 1979).